No, not like that! 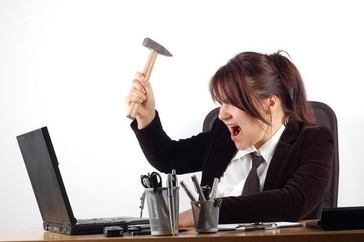 Computers can be frustrating sometimes, but the suggestion to 'hammer it out' shouldn't be taken literally. Sometimes checker games can be frustrating, and you've got to hammer out a solution. In today's Checker School entry, continuing our series of 'gem' problems, we have something composed, appropriately, by Wm. M. Hammer. If you're Black, you might be frustrated at the difficulty of hammering out a win. If you're White, and a man down but with a centralized position, you might be frustrated at the difficulty of hammering out a draw. Yet a draw is there. Work it out and then pound your mouse on Read More to see the solution. 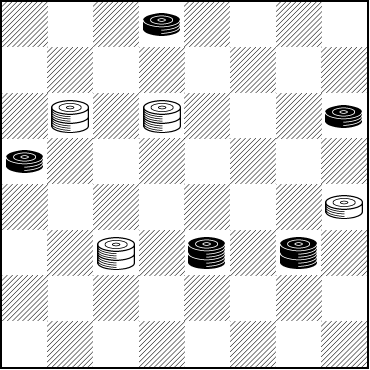 9-14 24-19 14-9 23-27 9-14---A 19-23 14-9 27-31 9-14 23-26 14-17---B 26-23 17-14 Drawn---C.
A---White shuffles his piece and dares Black to find a win. B---Black is making no progress. C---White now simply shuffles a different piece. There is no way for Black to win. We're not sure we'd, on our own, call this problem a 'gem' but it is certainly highly practical and instructive.